The Corp's identity text box is blank. "Are you crazy? We can't send in prisec until the media gets bored and goes home." While it's tempting to write this off as "The runner version of Cerebral Static" and call it a day, I believe a closer examination will reveal it to be far more powerful. Consider how turning off ID abilities differs across both sides of the Netrunner table. Runner IDs, broadly speaking, give them minor economic boosts, or small rig enhancements like or that would normally cost deckspace, drawtime, and a or two. Though seemingly minor, these little incremental boosts can be game-unbalancing over the course of 20 turns. Turning them off temporarily, however, is usually not going to give the corp anything other than a very tiny economic edge until another current is dropped or an agenda is stolen. For the corp, turning off an ID ability is most impactful when it actually opens a scoring window, or when it throws a huge wrench in a decklist that relies on the ID too heavily. Cerebral Static probably gets the most mileage against Noise, Leela, or possibly Nasir. What about the runner, though? If Haas-Bioroid: Engineering the Future is any indication, Corp IDs are designed in pretty much the same way - minor economic advantages or efficiencies. Or...are they? I could keep going. The point is not that corp IDs are more powerful than runner IDs - they really aren't. But (at the moment) Corp IDs are more likely to fundamentally change the way the game is played, so allowing the runner to turn off those abilities suddenly can be much more devestating. I would just like to point out that it is now theoretically possible to tie a game. Harmony Medtech: Biomedical Pioneer. If the runner has six and the corp scores an agenda bringing them to six while knocking out the current, suddenly both sides have the required agenda points. 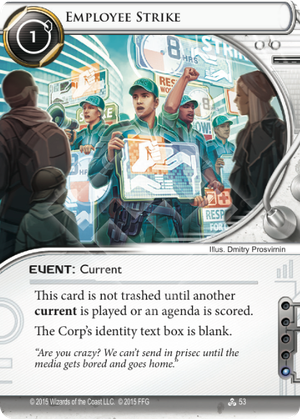 Due to the asymmetrical nature of Netrunner, there is more to consider when comparing similar Corp and Runner cards than simply face value. For instance, Kati Jones and Shell Corporation are functionally similar. However, Shell Corp can be trashed much easier than Kati. Also, since the Corp only has 3 clicks to spend per turn, it is significantly less efficient for the Corp than Kati is for Runner. But Shell Corp can also be bluffed as an agenda, protected by Snare!. These small, indirect interactions make comparing the two cards at face value very difficult. The same is true for Employee Strike and Cerebral Static. Functionally they are the same, but because of the nature of Corp play, Employee Strike is much more potent than Cerebral Static. For one, it is much more difficult for the Corp to score agendas than the runner. The Corp needs scoring windows, and their ID ability is likely necessary at least in some small way to help create it. However, besides Employee Strike, which costs influence for every faction, runners are much less likely to run currents than Corps. So it is more likely that the Corp will have currents in their deck to turn Employee Strike off than the runner will have to turn off Cerebral Static. It remains to be seen if Employee Strike will be a meta shifting card. On the one hand, some very popular Corp ID's, such as Replicating Perfection and NEH, suffer pretty heavily from this card. On the other hand, it is a deck slot and an influence per copy, and spending influence on cards that don't directly help you score points can be risky. But if one particular Corp ID tends to give your deck hell, it may be worth consideration as a one of in your deck.